Happy Saturday! Now that you have read the post of shows I attended during New York Fashion Week Men’s, here is a recap of the looks I wore for each day. My focus during this season was all about warmth and I am not always the one to compromise warmth just for the sake of looking cute (I am not trying to get sick). So keep scrolling to see my outfits of NYFW Men’s for AW18. I appreciated a great sweater that makes me look chic but provides the warmth that I need during the harsh cold weather. There was extra time to stop for some tea to warm my body up before heading to Suitsupply presentation. I love cable knit sweaters because not only are they warm but they also add texture to a look. Plus they come in various knitting patterns! I layered my sweater with my favorite red coat which I have been wearing non-stop, for a bold contrast. First time for everything, but I threw on a black beanie. Hey, it was cold. I wore my newly founded black jeans and elevated the casualness with black pointed kitten heels. The faux fur on the ankle adds a bit of luxuriousness to the outfit. For my second look, I was in the mood for pearls, ruffles, and denim. But not just any denim, duo-tone jeans. I have been looking for this type of jeans for the longest time. The pinstriped top had the courtesy of single-layered ruffles to add a feminine touch, layered with an edgy shearling coat, paired with some duo-tone jeans. Another element of the jeans I love is the frayed and jagged raw cut at the ankle. White kitten booties were the way to go with this look along with a matching white bag and capped my look off with an embellished cap. My last look was inspired by the Parisian style but I couldn’t find a beret at last min. So a newsboy cap had to suffice which went well with the look. You probably can tell by now that I am in a knit sweater frenzy. Bell sleeves, white cable accents and a pair of high waisted acid jeans just seemed to fit perfectly with comfortable sock booties and a gingham necktie. 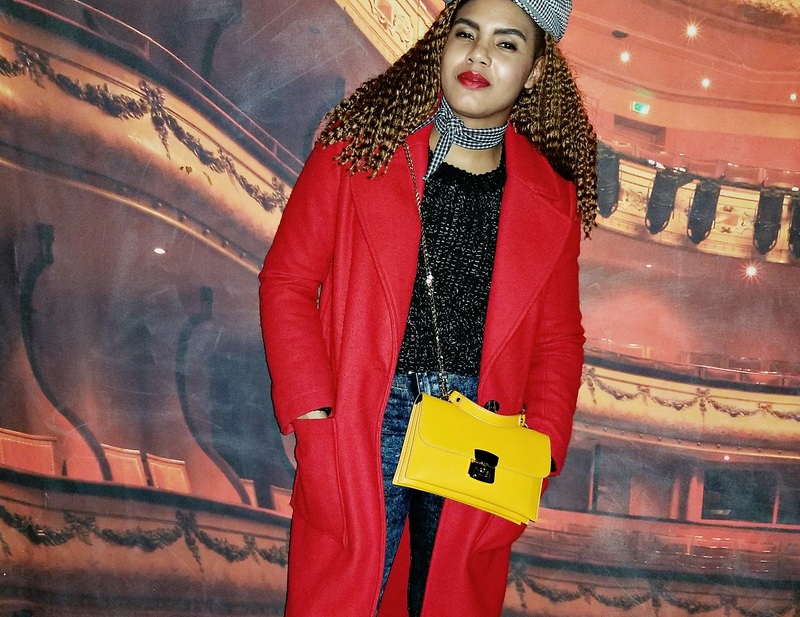 I love a splash of color so threw on a red lip and a color I have totally been crushing on lately mustard yellow. I hope you enjoyed this recap of outfits during NYFW Men’s. Next up, recaps of NYFW shows and the looks I wore. Thank you for reading!